Built with commercial-grade components, the ProLine® gas models are made for durability and designed to help lower your monthly energy bills. 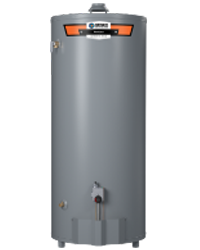 The ProLine family offers a wide range of water heating solutions—from models that help you qualify for gas utility rebates to high recovery models ideal for large families with high demand for hot water. 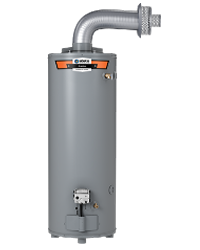 And, our specialty vent gas water heater options can be installed almost anywhere in your home because they can vent up to 125 feet. Our direct vent models feature two-pipe combustion systems that draw clean air from outside the home, eliminating any worries about indoor ventilation. 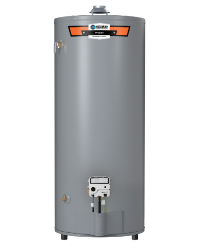 State ProLine gas water heaters feature an FVIR Compliant design, which meets the ANSI Z21.10.1-CSA 4.1 standards for flammable vapor ignition resistance.Select water heaters are available in a variety of heights which can accommodate installations with limited space. State ProLine High Efficiency Water Heaters have an internal microprocessor which provides enhanced operating parameters and tighter differentials for precise sensing and faster heating response to optimize performance. The ProLine Manufactured Housing meets the Federal Energy Efficiency Standards effective January 20, 2004, according to the National Appliance Energy Conservation Act (NAECA) of 1992. The ProLine Power Vent water heaters have been engineered to maximize efficiency and deliver a greater uniform energy factor (UEF). All models meet the September 2010 ENERGY STAR requirements and may also qualify for local utility and rebate programs. ProLine Direct Vent design is a one-pipe, dual-channel which draws all make-up air from outside the home, eliminating problems caused by insufficient indoor ventilation. ProLine Ultra-Low NOx gas water heaters are available in a variety of capacities to accommodate a multitude of application installations. 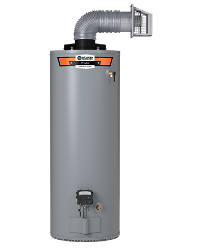 State ProLine Ultra-Low NOx Direct Vent residential gas water heaters offer horizontal or vertical venting options in an FVIR solution to reduce the risk of accidental fires involving flammable vapors.